Group tax is the rules concept, for go scoring, of deducting one point for each eye required for the life of a group at the end of the game. It was used in China before modern area scoring as a convenience in stone counting, and before that, with territory scoring in both China and Japan. You subtract the eyes needed for life from the area, since the player cannot afford to fill those points. 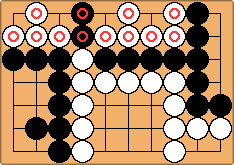 In oriental literature, such as A Journey in Search of The Origins of Go, the rule is called kirichin. What happens with a seki like this one? If the group tax is used with area scoring, as is was in recent history, then each of the White groups in the seki are taxed one point, since they each need an eye to live. The group tax provides a way to do stone counting. White then gets 25 - 2 = 23 points for the independently alive group plus 5 - 1 = 4 plus 7 - 1 = 6 points for the seki groups, for a total of 33 points. Black gets 15 - 2 = 13 plus 14 - 2 = 12 points for his independently alive groups, plus 2 points for his seki group, for a total of 27 points. 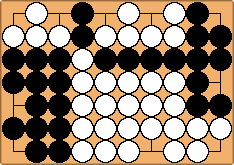 Ancient go used territory scoring with a group tax. That may be a historical reason why eyes in seki do not count in Japanese scoring. This is the way the group tax takes effect. Now we just count the black and white stones once no more plays can be made, and there's the score. B: 27. W: 33.